Combat isn't really for the beginner, but once you've had a chance to sharpen your flying skills and you can fly without getting all flustered, you're probably ready! Plus, most combat planes are nearly indestructable, so as long as you don't hit anything valuable, like human body parts or that expensive car parked nearby the slope, it can be a safe entry point for even the beginning pilot. Most combat planes available these days are made of one or more different kinds of foam construction or a hybrid of foam and other materials. The construction is really different than that of the typical kits of balsa and other materials. Most of the planes are made entirely of rubberized foam plastic. The foam is sometimes expanded polystyrene or EPS, the same stuff that 'styrofoam' coffee cups are made, colored foam (like blue, pink, or gray, some sort of urethane foam), Expanded Polypropylene or EPP, or a new foam known as Expanded PolyOlefin or EPO. Often, the combat plane of choice is a flying-wing configuration, as there's just less parts to break off during an encounter in the air. However there are many different types of combat planes available, such as warbirds or even jets. I have sometimes taken electric power planes, removed the motor, added a bit of noseweight to match the weight of the motor and flown them as a combat warbird, such as FW-190 and P-47 Thunderbolt. For example, The Bizz is made of a combination of blue-urethane foam and EPP wing leading edges, while the Zagi 5C is made of EPP foam. The other material that is used typically on the flying surfaces is called Coroplast. Coroplast is a plastic, corrugated material that is light and durable. It also comes in a variety of different colors. You can build most combat planes rather quickly as all that needs to be done is to cut openings in the foam for the radio, glue or tape in the radio & servos, cover the wings and flying surfaces with colored mylar tape, and throw 'em. I've built a couple of Zagis in as little as three hours each. Being made of foam, these combat planes are REALLY durable. You can smash 'em into the hill at warp speed and all that usually happens is the tape covering gets a bit scuffed or the nose gets dented. Nearly 40 years ago a few of us flying-geeks did some combat flying with styrofoam 747's (the throw-toy type you used to find at airports). We'd cut holes in the EPS foam for a radio system, taped on balsa ailerons and flew them until there were just bits left. Those planes were fairly fast and fairly durable, but don't compare at all with the durability or speed of planes you find made of primarily EPP. EPP foam is more like rubber than that of styrofoam and causes these planes to 'bounce' off each other, the ground, and even people (like my thick head). We didn't use strapping tape for strength either; I guess we had foam for brains too - instead we used heavy duct tape. Standard video is not supported on Internet Explorer, try using Google Chrome for better results. One thing to note about combat: be prepared for fast action, where pilots will intentionally chase you in the air and try to knock you out of the sky. These collisions aren't the kind of mid-air hits that sometimes occur while flying other types of planes, but rather this is the goal! Flying combat requires a toolbox full of spare parts for your plane, like extra clevises, pushrods, control horns, a large supply of strapping and mylar tape, and quick repair skills. Every time you or someone else gets knocked-out-of-the-sky (where you end up on the ground), is known as a 'kill '. You also get points for mid-air hits where some piece of the plane is broken off as well. Zagi's and other flying wings are notorious at getting their wing tip fins broken off as, well, as they're just taped on. Luckily, Zagi's actually fly decent enough without the fins. Sometimes at a popular flying site, you may have to share the air with one of the 'civilians'. Civilians are other planes NOT intended for combat, like 'floaters', racing, or other sailplanes. It is very common to share the air with these civilian aircraft, just be considerate while you do it. Even though a combat plane is commonly made of foam, it can do quite a bit of damage to a plane made of balsa wood or even a composite, carbon-fiber wing. 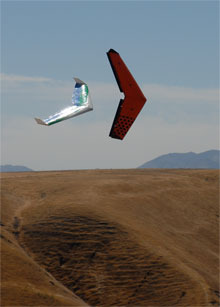 I've seen a $20 foam wing utterly destroy an expensive, beautiful open class sailplane without receiving any damage in return. At the first BASH (Bay Area Slope Heads) I attended in Los Banos many years ago, I brought a gaggle of planes, but spent most of my time there flying and field-repairing just my Zagi. In the space of about 4 hours, I broke 3 nylon clevises, 2 control horns, and knocked off my wing tip plates at least a dozen times. I probably was 'killed' more than a dozen times that day too, but I had the time of my life. I went home with some battle damage like colored scratches, torn tape, etc., but the Zagi was still perfectly flyable. If you want to see some more action pictures of combatting style, visit the BASHing link. One of the rules of thumb for combat pilots is to be friendly on the ground and aggressive in the air. Mid-air collisions not only happen, but are the real reason you have one of those combat planes, so be forgiving if someone manages to break something a little more permanent. Hey, no one forced you up in the air. Just remember that next time it will be your turn to knock him or her out of the sky. If you manage to knock them all the way down the hill, it is common courtesy to help them look for their plane. Please be courteous, it just makes for more fun for everyone. Some of the skills that help make a combat pilot great is your ability to perform low, ground passes, where there's just a few feet between your plane and the ground. Flying inverted skillfully is handy as sometimes you get flipped upside down near the ground, and the only way to survive is to fly out inverted. Having some peripheral vision skills can aid your flying immensely as it really helps to know where your "targets" are at all times. So practice your skills and blow them away when you get to the next battle. I always try to keep my planes as light as possible. Some people, in order to keep everything from getting 'dinged' will cover every square inch of their planes in strapping or filament tape even in places where it doesn't matter. I've found that heavy planes don't always "kill" more often than light ones. Rather, light planes always seem to be higher in the sky and therefore at an advantage. Your mileage may vary. My best results have been to follow what the kit or manufacturer has to say about their kit and just follow the instructions. However, when building for combat and trying to keep your plane lightweight, you probably shouldn't use the lightest servos or linkages. Servo arms can get broken right off at the base of the servo. I usually use standard or otherwise strong (and fast) servos that won't easily get stripped by too much force being applied to the arms, either in the air collision or by hitting the ground. When possible, use servo wheels rather than arms as they're a lot stronger. Also, I prefer metal clevises with "keepers" (either a piece of plastic tubing, metal clip, or even a section of plastic drinking straw) to keep the clevis from being snapped off the control horn. My favorite standard combat servo is the Futaba S-148, which is an inexpensive, older servo design that stands up to quite a bit of abuse in the combat arena. Using servos that have metal output gears can also help from receiving servo damage. Sometimes, but not very often, you make break something that you just can't fix at the field, so it makes sense to have more than one combat plane prepped and ready for the next battle. Since the advent of the combat slope soaring phenomenon, there are now many contests that are occasionally held on various fields throught the U.S. and internationally. To keep the contests and basic combat events safe and fair, a set of guidelines have been developed to ensure pilot's safety as well as spectators that attend. Here's the British Association of Radio Control Soarers Combat Guidelines to refer when building and flying combat (apologies to my U.S. translations). Many of the guidelines are just some simple ideas to keep yourself from getting hurt.